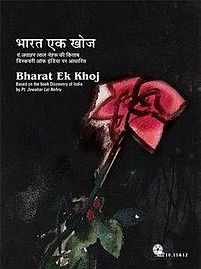 Episode #10 of Hindi TV Serial Bharat Ek Khoj (which was aired on DoorDarshan and now is available as a set of DVD for home viewing); focuses on Acceptance And Negation Of Life – the topic which focuses more on philosophy and ideology. In very early days the Arya people were quite busy with the livelihood and fulfilling the basic needs. Over the period of time, the people started getting settled and the way of life started taking a firm shape. The concept of Dharma – which is not merely a synonym of Religion – but a way of living a responsible life – came to existence. Over the period of time, the concept of God was introduced and the fantasies of human got wings. In the last segment of Vedic era (which is also known as Vedant) the Upanishadas came to existence. Also, the run for the power and authority irked, and big kingdoms like Pataliputra and Magadh started taking over the small republics. It was the time of threshold when the Vedic culture was being emerged in the different way of living, which is mainly focused on farming, republics and kingdoms. The people’s respect and faith in Vedic culture started shrinking, but however they haven’t thought to get away from the Vedic culture. The episode explores the tale of – Nachiketa which is mentioned in Upanishada. Nachiketa was a son of Vajashravasa, a Brahmin sage. Young boy Nachiketa got to know the truth about the supreme-self. He was the one who got to know that the human soul is different than the body it lives within. He was taught by Yama – the God of Death – himself, about this sacred knowledge. It is worth to note that the meaning of Nachiketa is : that which is unperceived. We see that Vajashravasa (there are places where he is referred as – Vajashrava – also) is on the death bad and his last time is knocking. He was told by a Brahmin to do some philanthropy in the last time, as the cure to his illness! Of course, it should be done voluntarily and it should not be forced by the society, by making the person – a victim. Of course these are our personal thoughts, and you may think something different. Do let us know what you think via comments below. Vajashravasa decided to do some philanthropy after getting advised by his family. He promised to donate all the cows he possess!! He then calls in his son Nachiketa to bring in the cows which were unable to give milk. As there were so many cows having that condition, and they are useless from a perspective! Nachiketa – however raised a question that how can doing such meaningless charity will be beneficial to him (Vajashravasa) anyway? Nachiketa then insists his father that, if he want to do some good and meaningful philanthropy, he should rather donate Nachiketa to someone!!! It leads to the war of words between Nachiketa and his father! Where ultimately furious Vajashravasa tells Nachiketa that he gave him to Yamraj (aka Yama – the God of death)! What happens then after is better to watch on screen. The episode also contains much more than the story of Nachiketa. It also reveals the biggest positive point of –Hindu– dharma, one should be curious enough to know the truth and one should keep asking till he got satisfaction! Remember – the greatest book on the Earth – Shrimad Bhagvad Geeta – aka – Geeta – is nothing else but the Question-Answer segment between Krishna and Arjun. Anang Desai is convincing. The boy playing Nachiketa is not convincing though. Anjan Shrivastav is first rate. Rest of the cast members do their jobs. Om Puri is fantastic. Ashutosh Gowarikar is in small role. The sets are not larger than the life, yet good enough and more realistic. The dialogs are witty and first rate. The background music is effective. The DVD quality is also good. Content wise this episode have a lot to offer which should not be missed. It is definitely a worth watching episode which gives you the best of the time you spend watching it.